ChemValve is a manufacturer of high performance, extended life (on average two times the life of other valves,) Fully Lined Ball Check Valves. These valves are designed to give the customer a valve that will last longer and perform better in the line. The ChemValve Fully Lined Ball Check Valves include the Models 880-150, 880S-150 and 880S-300. These valves are manufactured in sizes 1” to 8” for a variety of pipe line sizes. The liners to our ball check valves are injection molded for better liner life over time. This process creates a uniformly dense thickness of heavy plastic lining ensuring no weakness in the liner. Extremely important is that the plastic is also “locked-in” to the machined dovetail grooves in the metal parts. The spring assisted ball check valves offer high precision to ensure performance and these valves can handle horizontal or any other piping installation oreintation. For details about our liner options, visit our Liners web page. 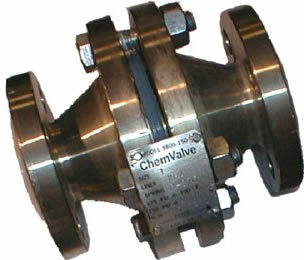 ChemValve will engineer our product to fit the application needs of our customers. The ChemValve spring assisted ball check valve has a Hastelloy C-276 spring as standard material. ChemValve offers other alloys for the spring such as titanium and Hastelloy B. We can encapsulate the Hastelloy springs in PFA tubing (or other material) to provide for those applications where there is severe corrosion. 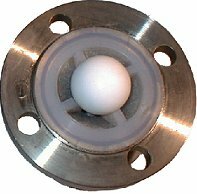 The solid PTFE balls are machined to accept the spring. The spring assisted design prevents water hammer and other problems on liquid service when installed in a horizontal piping orientation. Also, with non-spring assisted valves there will be some back flow required before the ball checks off. Just as important, there are specific pressure drop limitations in the “check” position for the non-spring assisted ball check valves. This is true even if the valve is installed in the vertical “ Flow-Up-Check-Down” position. 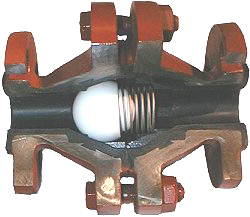 Please see the link 880-150 Lined Ball Check Valve for these pressure drop limitations. Another important example of our custom design capability is with a sulfuric acid injection application. We have helped solve the migration problem( the sulfuric acid drawing water back through the check valve) by providing special high rate springs that require approximately a 10 psi differential pressure just to crack the ball off the seat. This insures that there will be adequate seating force and will prevent the “migration” problem. Other PSI rated springs are available for special applications that require it.